Here, are 3 free Windows 8 Keyboard Shortcut apps that teaches you Windows 8 shortcuts so that you can access this new OS quickly and easily. It’s very easy to browse Windows 8 using these hotkeys. 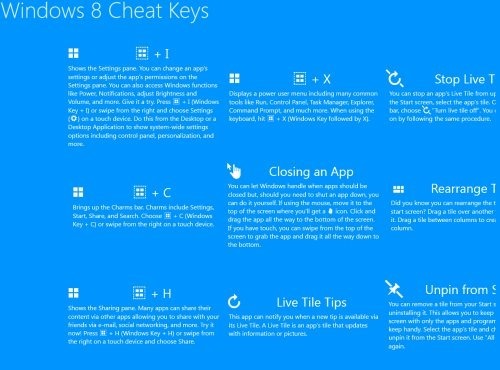 Windows 8 Cheat Keys is an informative Windows 8 keyboard shortcut app that brings you a list of hotkeys and other important tips so that you can quickly & easily get around in Windows 8 OS. You can find shortcuts for many familiar features as well as many new and handy ones. This keyboard shortcuts Windows 8 app gets updated time to time and introduce you with the new hotkeys via toast notifications and live tiles. Live tile updates provides maximum retention and understanding, else you can also browse around all the existing keyboard shortcuts. You can easily search for a specific shortcut using the integrated Search charm, share hotkeys with others from within the app, Enable / Disable toast notifications, or just see the updated live tile. Go ahead and download Windows 8 Cheat Keys app in Windows 8 now. 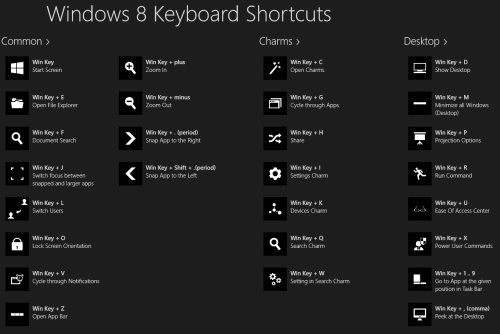 Windows 8 Keyboard Shortcuts is a simple app where you can find a list of hotkeys that you can apply on your Windows 8 OS. The unique part about this Windows 8 keyboard shortcut app is that the hotkeys have been categorized into three different parts: Common, Charms, and Desktop. You can learn them to browse the Windows 8 OS quickly and easily. It’s a must-have app. Go ahead and download Windows 8 Keyboard Shortcuts app in Windows 8 now. Keyboard Shortcuts is another hotkeys Windows 8 app that teaches you different useful shortcuts for Windows 8, Calendar, and Mail. This keyboard shortcut app for Windows 8 helps you become the master in shortcuts for Windows 8, Calendar, and Mail app. As you open the app, you will find three different sections: Windows 8, Mail, and Calendar. Well.. Windows 8 category brings you all Windows 8 shortcuts, while Mail and Calendar app shows all the Mail app shortcuts and Calendar app shortcuts, respectively. Each category is further divided into different sections. For example, Windows 8 Shortcuts section is divided into The Basics, Charms, Searching, Metro Commands, Desktop Commands, Advanced, Switching, and Language. Similarly, Mail and Calendar are also divided into sections. There are approx. 90 keyboards shortcuts for Windows 8, Calendar, and Mail apps. You can also share shortcuts with others, from within the app. Go ahead and download Keyboard Shortcuts app in Windows 8.